Provence isn't really one of those destinations that you need to convince people is beautiful and worth visiting, so I'll spare you all that and fill you in on some fun things we did and answer some of my own questions I had before leaving. There are lots of things I just couldn't find out about - a combination of me trying to over-prepare in case my french failed us (a very likely scenario!) and a lack of websites and information online (so french). While the upper Northeast was still dragging itself out of winter, Connecticut was a virtual rainforest of lush greenery, even early in May. I’m always thinking that since I grew up in Maine I never really got to spend too much time on the coast because there was always a lake or pond to jump in so the Mainer mentality is why bother driving to the ocean? This is why you bother! Alia and Ryan took over the Cliff House in Ogunquit for their wedding, filling the ballroom with flowers and their contagious joy. Since I'm so delinquent I'm about to post about their wedding, I would be remiss not so show a couple favorites from Tiare and Dan's engagement shoot in Old Lyme, CT.
After taking a $5 uber from the airport, we already found this to be a magical place, but Mexico was just getting started. My first stop in any new city is usually a bakery, and when I heard that Panaderia Rosetta had a specialty guava/danish/croissant, you better believe I was there when the doors opened. In fact almost all the following mornings started by ordering x rols de guayaba. How could we not? Everything about this day, these people, this venue, makes my heart absolutely swell. There was blazing foliage, a white boxer-of-honor, golden light and tons of love - more than I could ever hope for at a wedding. Remember the sleepover game where one person started laughed and it contagiously made everyone crack? Whitney and Scott's wedding was full of that same tummy tickling joy and anticipation. Vieques. A place you have either never heard of or one you are eagerly planning to return to. The perfect destination for one of my favorite types of travel. The kind where you drive aimlessly and stop and explore. In this case, beaches with no one else there, narrow jungle roads, and small towns. It is not the ideal vacation location for people who need to be entertained. But if sunrises, jungles, surprisingly great food, and an occasional (ok, one) termite swarm are your thing, then you'll be in heaven. I had never really considered New Hampshire as a possible location for glamour until Emily and Chris (aka the young Kennedy lookalikes) showed me the way. Having known each other since high school, there was no division between sides of families or whose friend is whose. They even went to prom together and looked the same then. Hi, I want your genes. With a good chunk of the day before Elina and Dan's rehearsal dinner, it was time to hit the ground running once we landed in Nashville - or rather, start shoveling hot chicken into our faces. It went: coffee, hot chicken, ice cream, flower truck, repeat foods. Which, if this needs clarification, is my ultimate trip pattern. Someone who can combine garden roses, succulents, driftwood and custom Lego people is someone I need in my life. They may be someone I have begged to let me join their family (and chances are that person is nice enough to say "OK!" and not roll their eyes at me). Elina and Dan invited their friends and family down to Nashville for their wedding weekend and I was so grateful to be on hand to document their day and to have a chance to see a little bit of the city (translation - the inside of the hot chicken place). When I left Boston the morning of Kristen and Travis's wedding, the weather forecast was a series of scary looking clouds and lightning bolts. Somewhere along 95 on the way to Rhode Island the sun emojis changed their attitudes, and by the time I pulled up to the Dunes Club I parked, squinted outside in the sun, checked the weather again and saw the suns wearing sunglasses. I'll take it! The remnants of the hurricane (HUGE waves) provided some pre-wedding relaxation (probably not the right word) for the body-surfing groomsmen. Further signs I'm getting old include me biting my nails watching them, fretting that this probably wasn't safe. From the surf break to the weight room, the guys got ready on one side of the Dunes Club while the ladies had a awesomely preppy- Palm Beach-esque suite. It's never fair, guys, but when life hands you a gym to get ready in, you go with it! As far as I'm concerned, this was a perfect evening. Uninterrupted fields of queen anne's lace, golden sun, rock-skipping, and beautiful, madly in love people. It's always a great sign for me when I find myself actively wondering during a wedding, "how is the best way to get one of these families to adopt me?". The great part of Caroline and Bryan's wedding - aside from the warmth, love, steak (thanks guys!) and really everything else - was how genuinely nice every single person in and at that wedding was. It made the day so meaningful and fun. Caroline and the ladies got ready at a gorgeous restored cottage in Dartmouth, then we moved to New Bedford for the ceremony and party at the New Bedford Whaling Museum. This place is so fun. Where to even begin with Matt and Clare's wedding. The midwest has charmed me again! On the way over in the morning, I pulled the car over countless times to observe/photograph/pick wildflowers and shake my head at how beautiful Michigan is. Combine that with the most welcoming and laid back wedding party, friends and family, unfettered use of the golf carts (!!! ), people willing to bring me lunch, feed me buttered rolls and palm me tiny bottles of wine (you guys know who you are - love you) and you get some of the fantastic experience. Those glorious film colors (#teamEktar) are now burned in my brain as what Tel Aviv looks like. If we could add smell-o-vision of fresh frying falafel and pita and herbs, then it would be perfect. And I need to get breakfast ASAP before I start gnawing on the computer thinking about the food. With Dan on a work trip to Tel Aviv, I naturally invited myself to pop over for a few days. 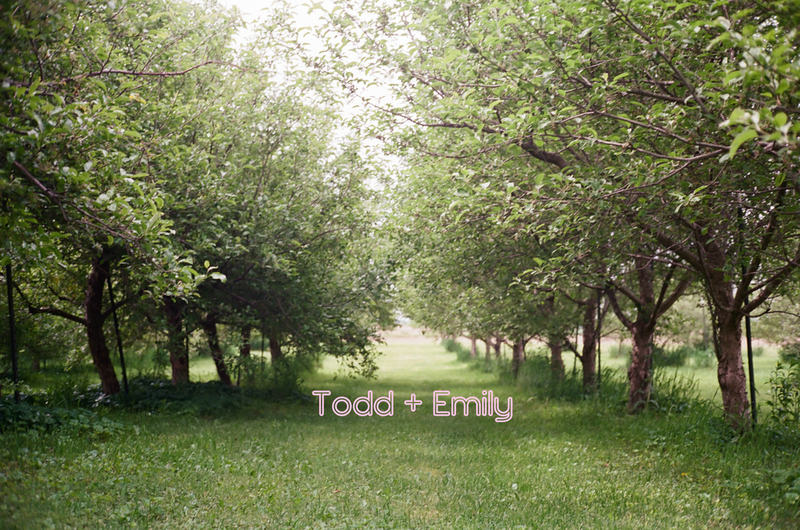 Todd and Emily got married at Sutliff Cider in Iowa - a state where I frankly did not know what to expect, having only experienced a drive by of the quad cities a decade ago. It turns out that Iowa City is a beautiful, shockingly friendly haven of ultra-cool. There were cornfields on the way in, sure, but I don't think that's what I'll be remembering. An afternoon of engagement pictures, burgers, and blossoms at Applecrest Farm Orchards with Kim, Andrew and Riggsby. ahhhh Provincetown during the off season. Free to wander Commercial Street juggling a pimento cheese-slathered biscuit and a pitbull with hardly anyone around to bump into.